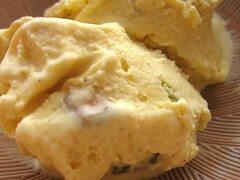 Saffron Cardamom Ice Cream - Do You Know The Muffin Man? I only used six egg yolks. Straining the cream gets out any cooked egg lumps, but also filters out the saffron threads. The ice cream is not too sweet but is strongly perfumed with saffron, the cardamom is barely detectable. The pistachios I used were salted, but I rubbed their skins off with a wet paper towel.